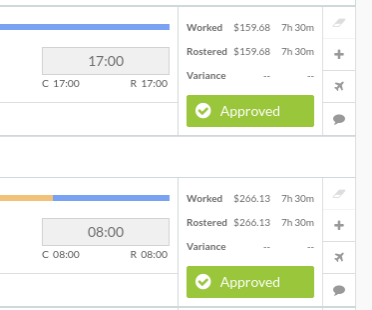 You can approve Timesheets in two different views, Daily or Weekly/Fortnightly. The view you use will depend on your workflow. Daily view lists the shifts worked by all staff grouped by each day. This is useful for Managers to approve shifts on a daily basis rather than going through individual employee Timesheets. Weekly/Fortnightly view lists each employee's timesheet for the week/fortnight. This is where Managers and Payroll can check each employee's timesheet for Award calculations and export to Payroll. Approving shifts daily is the best practice approach. By approving all your shifts at the end of each day, any amendments or leave to add in is fresh in your mind and by the end of the pay period, the majority of your timesheets will already be completed. By clicking on Timesheets > Daily in the header, you'll see a list of everyone that is either rostered or has clocked-in on the current day. Once you're happy with the shift, click the Approve button at the end of the row and you'll notice it disappears. Once you're happy with the shift, click the Approve button at the end of the row. Or alternatively you can also click the Approve All button at the top and bottom on the right of the screen. Keep in mind, once a shift has been approved the times can no longer be edited. You will need to unapprove the shift to start making adjustments again. To unapprove a shift, just click the green Approved button and it'll unlock. If a start or finish time is showing in red, the employee hasn't clocked this shift. You can either fill in manually or ask the employee to fill it in through the Portal. If an employee fills in a missed clock-in through the Portal or when the break time has been entered manually i.e the employee may have used the Time Clock but a Manager has manually overridden, it will display as a regular input field. Auto-breaks will display the same. If a break has been clocked with the Time Clock - it will display in the Timesheets with a small 'C' inferring 'clocked'. A manager can manually override this (shown by end break time of 10:31p being manually changed to 10:35p). You can assign a break as Paid in an employee's timesheet. Tanda treats these breaks as normal working time; the employee will continue to be paid their relevant rate through the paid break time. 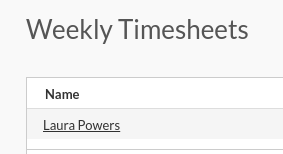 For further information on Timesheets, check out the other articles in this section in the Help Centre.